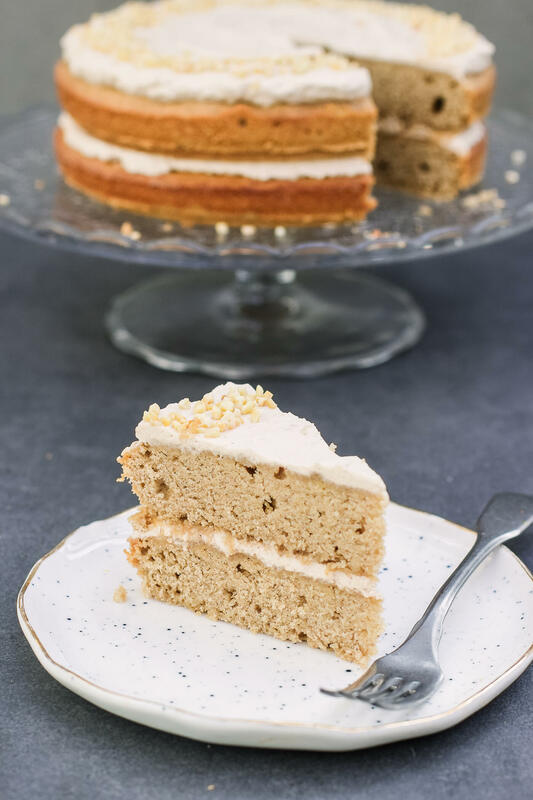 I love coffee flavour desserts and this crumbly cake with creamy icing is just heaven. 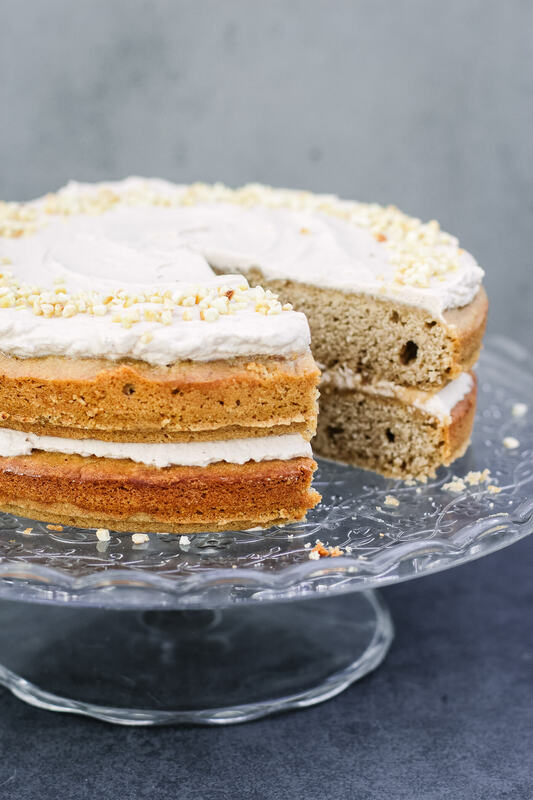 Really whipping the coconut yoghurt is the secret to the pillowy icing so don’t cut this short. I love it sprinkled with toasted nuts and it’s amazing with some grated dark chocolate too. Preheat the oven to 170’C. Make an extra strong cup of coffee and set it aside to cool. Add the chickpea water to a large bowl and use an electric whisk to whisk it on high until stiff peaks form, about 5 full minutes. When you have stiff peaks, continue whisking while gradually pouring in the maple syrup and then the coffee. In a separate bowl, mix together the ground almonds, buckwheat flour and baking powder. Grease two 20m cake tins well with coconut oil. Pour the mixture into them, dividing it evenly between the two. Bake for about 35 minutes until golden and a cake tester comes out clean. Leave them to cool completely on a wire rack before removing from the tin. Toast the chopped nuts in a pan on medium heat until golden, then set them aside. When the cakes are cool, make the icing. Add the coconut yoghurt to a large bowl with the maple syrup and cacao powder and whip using an electric mixer for about 5 minutes until whipped and thick. Pour in the coffee and whisk for another minute. Ice the cakes, sprinkle on the nuts and serve. Hi, just wondering if you weren’t making it vegan, how many eggs would you use instead of the chickpea water?